Note: In the event of SEVERE WEATHER (e.g. a snow storm), please CHECK YOUR EMAIL before heading out to our scheduled meeting. For MEMBERS WITHOUT EMAIL, our Emergency Phoners WILL TELEPHONE YOU IF OUR MEETING IS CANCELLED. 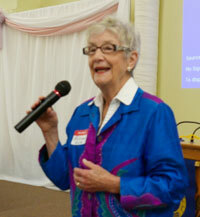 May 1, 2019 - Yvonne Leahy will speak on War Brides and how they met their spouses; plus, all the red tape on becoming Canadian citizens. Her memorable presentation will include pictures and supportive friendships through the years. 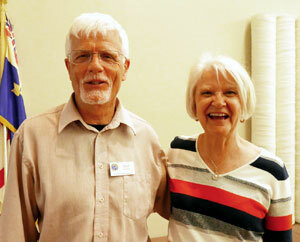 Yvonne was due to speak to us in February, but stormy weather cancelled our meeting. We are delighted that Yvonne was able to reschedule. 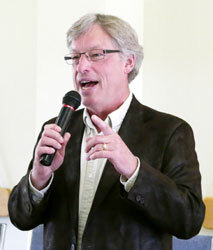 April 18, Swiss Chalet, 12 noon, 491 Towerhill Rd. July 24. 2019 at 2:00 p.m. Westben presents music from ABBA (approximately $40.00) - Cheques can be made out at to PROBUS Peterborough and will be collected on our meeting dates. Dinner will be at Chubby's Restaurant ($25.00 inclusive of tip and tea or coffee). We will be car pooling, travelling through Campbellford so a visit to the chocolate and cheese factories on the way could perhaps be arranged with the drivers. If you are interested, please contact Eleanor Bond at 705-745-7453. 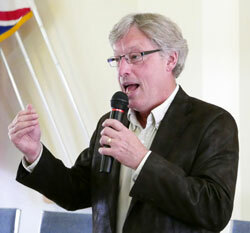 Award-winning journalist Sean Mallen played to a packed house on March 16, 2019. 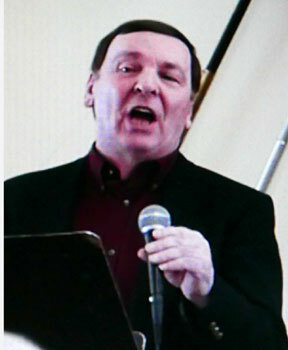 He was a reporter for Global News for many years. 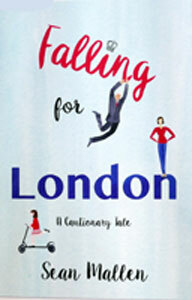 His book, Falling for London is the hilarious and touching memoir of how he and his family learned how to live in and love London, where he served as Europe Bureau Chief for Global TV News.Among the many international stories he has covered include the Royal Wedding of William and Kate. On November 7, 2018, Dr. Tom Bell (pictured below at right) gave us a very interesting presentation on the use of Medical Marijuana, and the setting up of informational programs for schools, seniors, and health care providers. 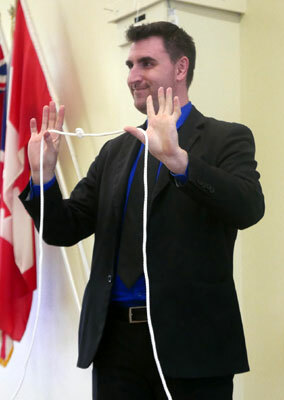 At our October 3, 2018 meeting, speaker Chris Kawalec (pictured at right) told us about "Age Friendly Peterborough" and the city services available for seniors. Our speaker on September 5, 2018 was Kathy Morton who gave us a very interesting talk on the development of the Buddhist Temple Site in Bethany, Ontario, the largest complex outside of China. 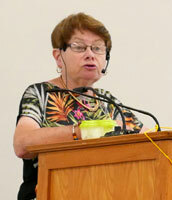 She is a very active supporter of the Buddhist Organization of Canada. 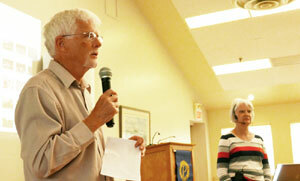 On June 5, 2018, Probus members Dave and Peggy Watton gave us a very interesting slide presentation on the medical services being provided in Uganda, and the work of Dr. Hardy Friesan's Peterborough Medical Brigade in 2014. As Probus members requested a presentation on Estate Planning, Peterborough lawyer Bill Lockington provided us with some very useful information on the subject on May 2, 2018. 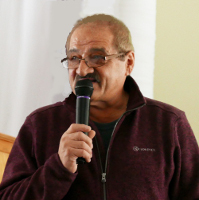 On April 4, 2018, John Rufa told us of the trials and tribulations of opening a small business, and the many government regulations, like zoning by-laws, particularly in relation to operating his own winery, "Kawartha Winery" in Buckhorn. 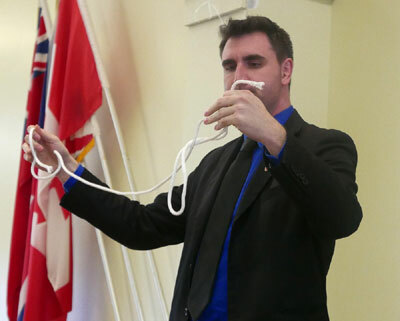 On March 7, 2018, Jeremy Bertrand from the Ministry of Finance helped Probus members better understand Ontario's Tax Credits and Benefits. Following his presentation, with March being Probus Canada month, (31 years), we celebrated the occasion at the Naval Club with a complimentary luncheon, and we had a Peterborough Probus Past President at each table. 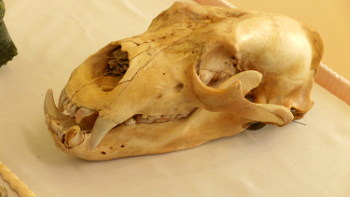 Our speaker on February 7, 2018 was denturist Wayne Paget, who told us about his trip to Baffin Island to help the Inuit people, who survive in such a remote community, and he brought us some artifacts to look at, including a polar bear skull. 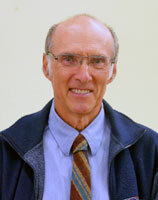 Peter Malkovsky is a retired professor of International Trade at Fleming College in Peterborough and has also lectured in USA, Mexico, Russia, China, Cuba, and other countries. 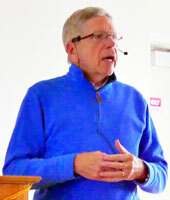 He gave us a very interesting lecture on current world affairs at our January 3, 2018 meeting. 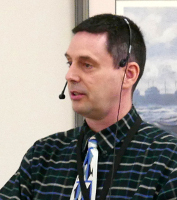 On November 1, 2017, our guest speaker was Graham Hart, news anchor for CHEX Peterborough, who gave us a very interesting presentation on the Halifax disaster of 1917. On September 6, 2017 Jeremy Bertand gave a very lively presentation on Estate Administration Tax also known as Probate Fees. 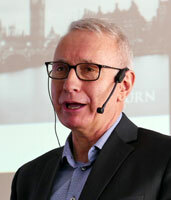 The central message of his presentation focused on the means of assessing the value of assets owned by deceased at the time of death which include real estate in Ontario (less encumbrances), bank accounts, investments, vehicles and all other property including goods, intangible property, business interest and insurance. Insurance payable to a named beneficiary and assets where there is join ownership with right of survivorship and real estate outside Ontario are not included in the value of the estate. On June 7, 2017 Rosemary Ganley entertained us with her slide show and talk about Russia, which we found very informative. 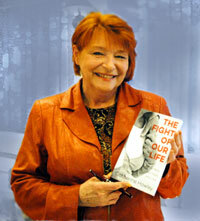 Rosemary has been active in international and human rights work for 45 years in Peterborough and overseas. 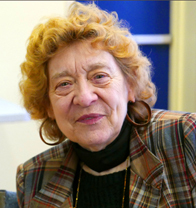 She taught literature in English in public, separate. and private schools in Ontario, Quebec, Jamaica and Tanzania.She is well known in Peterborough for her involvement in Jamaica's Self-Help program and her column in the Examiner. On May 3, 2017, we were entertained by author John Boyko. who has written seven books, including the bestselling Blood and Daring: How Canada Fought the American Civil War and Forged a Nation and the critically acclaimed Cold Fire: Kennedy’s Northern Front. 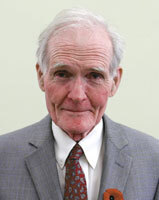 The Globe and Mail has deemed him “a distinguished scholar of Canadian political history.” John lives in Lakefield. 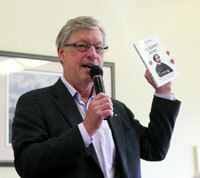 His latest book, Sir John's Echo. The Voice for a Stronger Canada, illuminates with perceptive precision the dynamic that made Canada work. 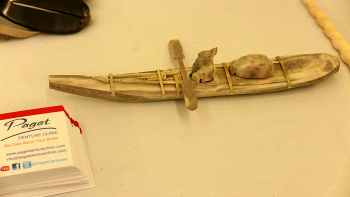 It is a striking contribution to the understanding of our history. 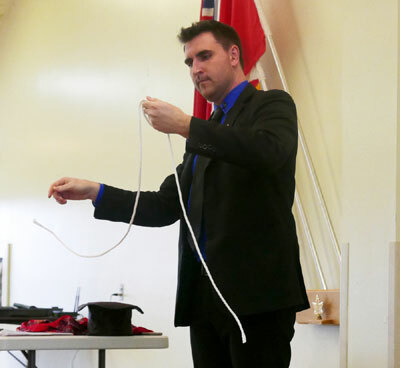 On April 5, 2017, Jason Chessar entertained us with his amazing magic tricks, and gave us an inspirational speech about his lifelong fight to overcome his hearing impairment, and extreme shyness, by becoming interested in magic. 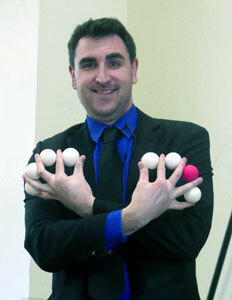 He is also an accomplished public speaker. 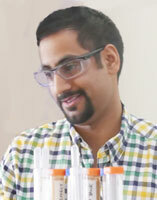 On February1, 2017, Darnell Khan, gave an interesting presentation on Kawartha Ethanol Inc. in Havelock through an interactive presentation and slide show on how ethanol is made and used. Kate Lines, retired chief superintendent of the Ontario Provincial Police (OPP), gave us a very interesting speech on January 4, 2017. Ms. Lines, who grew up on a farm in Ennismore, spent 33 years in law enforcement, working her way up from patrol police officer to criminal profiler, and eventually, superintendent. She has written a book, Crime Seen, which is primarily about her training and experience as a profiler but adds, when people ask about her career, her undercover work is often a point of interest. When she first started working undercover, Ms. Lines was in her mid 20s. She had spent the previous four years working as a traffic patrol officer. She wanted to try something new. Coincidentally, for the first time, the OPP was looking for a woman to go undercover. Most of the work was drug-related. Ms. Lines says her orientation into a community was often initiated by someone working as an informant. They would introduce her as their new girlfriend or wife, she'd work to cultivate relationships, and then the informant would back off. "I was able to buy drugs relatively easily," Ms Lines says. She spent her longest stint undercover working with the Outlaw motorcycle gang. 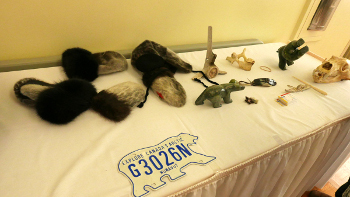 It was a project that spanned several years, involving four undercover officers. That work acted as a launching pad for Ms. Lines, who was the second Canadian to attend a criminal profiling training program in Virginia. From there, she joined detectives at the Criminal Investigation Branch of the OPP and climbed the ranks while assisting with a number of high-profile cases including, the abduction and murder of Kristen French, who died at the hands of Paul Bernardo and Karla Holmolka. During her time with the OPP, Ms. Lines was a proponent of the Violent Crime Linkage Analysis System - a tool that helps different police forces and jurisdictions share information to solve cases faster. Since she retired in 2010, Ms. Lines has taken on a teaching role with Fleming College and she's become a licensed private investigator, mostly handling human rights and corporate harassment issues. She is also the chair of the Victim Justice Network, an organization that's establishing an online network to promote awareness of services and support available to victims of crime in Canada. Ms. Lines, lives in the Peterborough area. 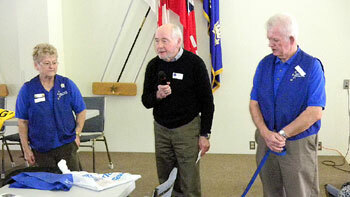 Dennis Carter-Edwards, a retired historian was employed for several years with the Trent Severn Waterway. On November 2, 2016 he shared with us some of the tales of the "Scandals and Scoundrels" that were involved in it's construction. The Trent-Severn Waterway is well known for its world class engineering features such as the Peterborough Lift Lock and the intriguing story of its construction over a period of 87 years.What is not well known is the story of the scoundrels, scallywags, connivers and rascals who were also part of the canal's construction and operation. Dubious local characters were involved in brawls, bribes and boondoggles, as Dennis, so colourfully explained to us. On October 5, 2016, Roderick Benns gave us an interesting lecture on modern day Prime Ministers. Of particular note were two Prime Ministers who held very short terms. Kim Campbell served as the 19th Prime Minister of Canada, from June 25, 1993, to November 4, 1993. She was the first, and to date, only female prime minister of Canada. Even shorter was John Turner's term, who served for just 79 days, from June 30 to September 17, 1984, as the 17th Prime minister of Canada. However, the first time that Turner received significant press attention in Canada was back in the 1958, when he was romantically linked with Princess Margaret, the Queen's younger sister, but apparently Buckingham Palace put an end to it. 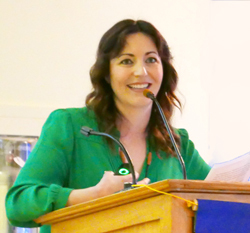 Our guest speaker on June 1, 2016, Megan Murphy, has had an interesting and varied career in the performing arts for over two decades. Since graduating from York University’s Fine Arts program, she has worked as an actor in both the local and Toronto film, television and theatre scenes. She is currently a morning show co-host on 2 Peterborough radio stations, 93.3 MyFM and 107.9 Classic Rock. In 2014, she went on a cross-Ireland bike trek which made local news headlines and will now be her upcoming documentary Murphy’s Law, screening on June 18 and 19, 2016 at Showplace Performance Centre. It’s been an ongoing journey filled with personal strength, surprises, and a lot of emotion. On her 35th birthday, she moved from Toronto back to Peterborough into her parents’ house. Her return to Peterborough was anything but a happy one. Having lost her 65-year-old mother Mary Anne to cancer in 2012 — and still grieving the 2004 death of her 57-year-old father, well-known Peterborough lawyer Marty Murphy - Megan had also recently ended a six-year relationship. She found herself at the lowest point of her life. It was during this dark time that she discovered something that would change her life forever. Megan decided to replicate the same 1,400-kilometre bicycle trip across Ireland her father took in 1973 — and then discovered he had left more behind than just the journal for Megan’s journey. 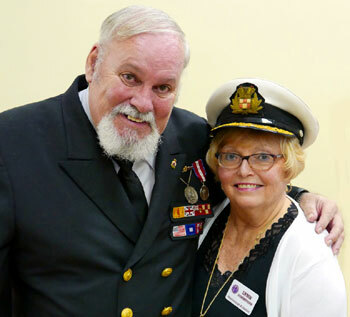 At our April 6, 2016 meeting, we were entertained by Sher Leetooze, who gave us a very interesting lecture on WW1 nurses. On January 6, 2016, we were entertained by members of the Peterborough Theatre Guild, who are celebrating their 50th anniversary. Gillian Wilson, a long time resident of Peterborough, has put a lot of time and effort into the Theatre scene, whether it be directing, producing or acting in many theatrical productions, including "Oliver Twist: The Musical", here at Showplace last year. "A vital member of the Peterborough Theatre Guild for more than thirty-five years, she has gained acclaim as an actress, production manager and director. She has directed four fundraisers for ShowPlace Peterborough as well as the Art School of Peterborough of which she is a member." On June 15, 2016, with longtime collaborator Beth McMaster, Gillian brings us "The Legendary Icon Series" with "The Many Colours of Judy Garland". Like everything she throws herself into, you will experience passion, dedication and a fantastic performance under her watchful eye. 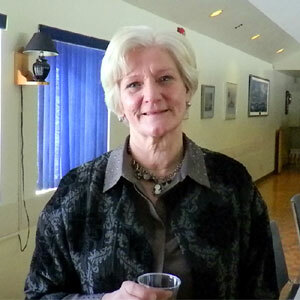 Beth McMaster, has been writing for the theatre since 1969. Her work includes audience participation plays and puppet shows for children and young people, and mystery thrillers for adults. 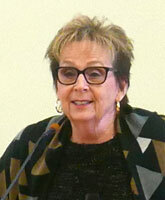 She is founding chair of Showplace. She was inducted into Peterborough's Pathway of Fame in July, 2000 and, the same year, was given Theatre Ontario's Maggie Bassett Award for outstanding contribution to theatre in the province. We were also entertained by vocalist Wayne Robinson (below left), who gave us a selection of songs ranging from the Beatles to Frank Sinatra to The Sound of Music, accompanied on the keyboard by Bob Trennum (below right). A good time was had by all, singing along to some wonderful music. 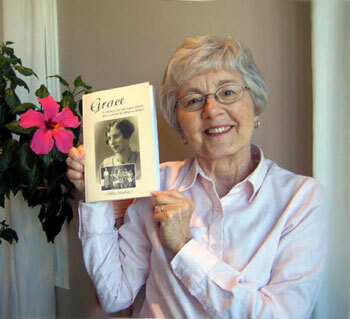 On November 4, 2015, our speaker Millie Morton, told us about a book she has written which details her mother’s experiences teaching in rural Ontario. 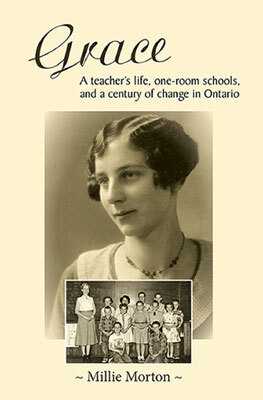 Grace: a teacher’s life, one-room schools and a century of change in Ontario is a book about the life of Millie Morton's mother Grace (1907-2008) in southern Ontario. It’s also social history – stories about how it was to grow up on a farm, teach in one-room schools, and live in small rural communities. It illustrates how much Ontario has changed – and education, too. Grace Morton — who died in 2008 at age 101 — had been, in many ways, a pioneer and a role model for future teachers. 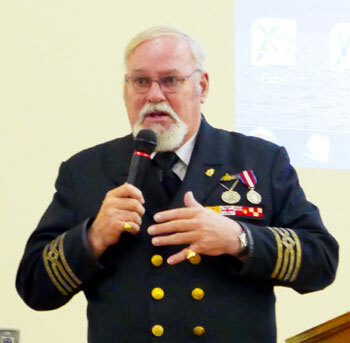 On October 7, 2015 Captain Eric Conroy entertained us with his tales and experiences as Captain of the SS Keewatin, which was built in Scotland in 1907. 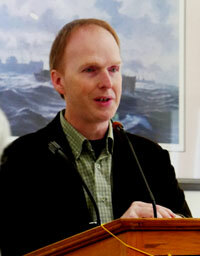 Captain Eric is the person who brought the SS Keewatin back to Canada in June of 2012. She was towed from Mackinaw City, Michigan, to her old home port of Port McNicoll, Ontario. The Keewatin is not only the last Canadian Pacific passenger ship, but also the world’s last surviving Edwardian passenger liner. The Captain's great life experiences were an important part of who he became and what he accomplished in his life. 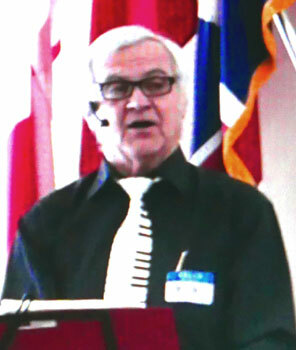 He was a high school teacher, a promotions salesman, an advertising executive, a restaurant owner, founded a chain of automotive stores, worked as the General Manager for the Canadian National Exhibition, consulted on Public Affairs with the Canadian Association of Chiefs of Police, founded and ran the largest children’s magazine in Canada and spent 29 years as a volunteer for Toronto’s famous Santa Claus Parade selling sponsorships. 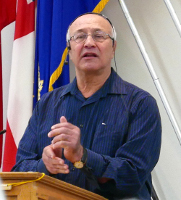 He is a distinguished member of the Royal Canadian Mounted Police Mess in Ottawa, a Life Honourary member of the Canadian Association of Chiefs of Police, and holds an Order of Bulgaria, an RCMP Challenge medal and The Queens’s Diamond Jubilee medal. 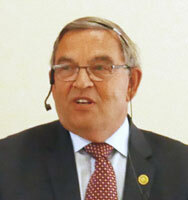 We were indeed priveleged to have him as a speaker. "Eric Conroy went to public school with me during the 50's in a small school, McKee Avenue School in Willowdale.We were in the same classes for quite a few years from Grade 2 to Grade 8. When we were in Grade 3 Eric played Joseph and I played Mary in the Christmas concert. 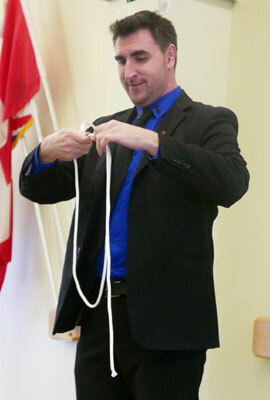 Eric, as you know from his talk at Probus, was always in trouble with the teachers...not paying attention and sent to the principal's office often. He probably had A.D.D. and they did not diagnose it back then. He was tall (6 foot 2 inches) and slim with dark hair and on the football team in high school...Earl Haig in Willowdale. That was the last time I saw him - over 50 years ago!! It was so nice to hear all that he has accomplished in his 70 years. " 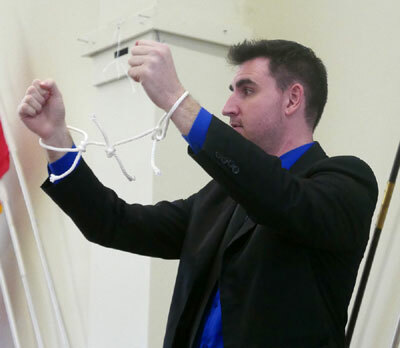 At our first meeting of the new season held September 2, 2015, Michael Newnham, musical director of the Peterborough Symphony Orchestra, gave an interesting presentation on the intricasies of conducting, and showed us various video examples of conductors at work, and how their styles differed. For instance, we learned that Leonard Bernstein didn't use a baton, but instead relied on his various facial expressions to conduct the orchestra. 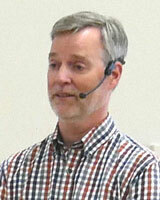 We thank Michael for a truly enjoyable lecture. 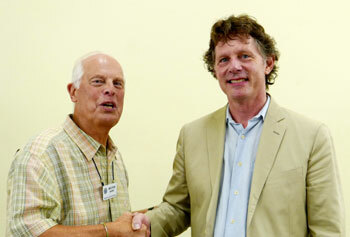 In the photo at the right new Probus Club President Milton Barry thanks Michael for his presentation. 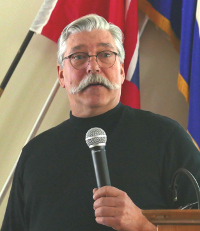 On May 6, John Boyko, a wonderful speaker and historian, kept us captivated with his compelling narrative of the American Civil War, and Canada's interaction, especially the pivotal role played by John A. MacDonald, Canada's first Prime Minister. 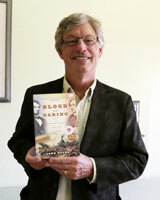 John Boyko's talk was both entertaining and education, and I think most of us had wished we'd had him as our history teacher.His excellent book BLOOD and DARING, How Canada Fought the American Civil War and Forged a Nation is a must read for all Canadians. 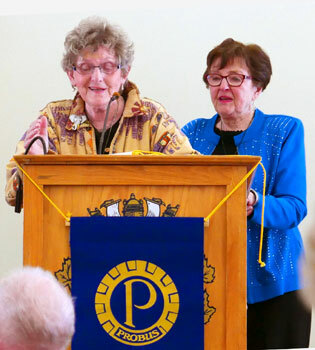 On April 1, Catherine Hawley told those attending the Probus meeting a true story of crisis, hope and love, about the struggles she and her husband went through when he was undergoing brain surgery. At our March 4 meeting, speaker Alan Mallory entertained us with an absolutely fascinating lecture and slide show describing how he and his family reached the summit of Mount Everest in 2008. Climbing Mount Everest is considered one of mankind's greatest feats of human endurance. The two month quest to reach the highest point on earth is a journey filled with unparalleled challenges and some of the roughest and most extreme conditions imaginable. Alan and his family decided to undertake the challenge becoming the first family of four to successfully reach the summit. He explained that it was an expedition that challenged the mental, emotional and physical limits of their entire beings but to finally reach their goal was an incredible feeling. 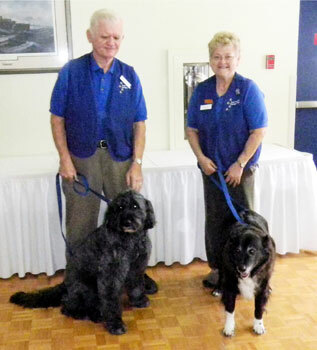 Our speaker on February 4, 2015 was Dianne McMillan of East Central Therapy Dogs, and her helper Bob, with 2 of their "4 legged friends", a bouvier, and a border collie..
Probus member Probus member Ken Gadd, a retired vet. thanks Dianne. 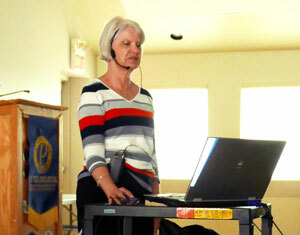 Our speaker on January 7, 2015 was Diane Pick, CEO of Five Counties Children's Centre, who gave us an very interesting talk and slide show. 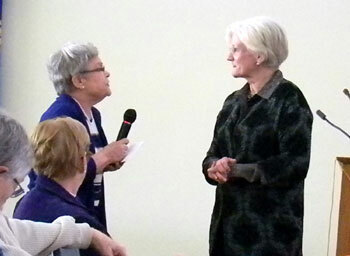 Probus member Myrna Moulton thanks Diane Pick. Diane Pick explained that Five Counties is a children’s treatment centre serving Peterborough, City of Kawartha Lakes, Northumberland and Haliburton Counties. 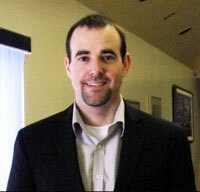 They help children who may need specialized services to reach their potential.